This Spanish edition of The 21 Most Effective Prayers of the Bible speaks to believers of all ages, backgrounds, and maturity levels with an uplifting message: that the prayers of the Bible are prayers for us today. Not an exhaustive, scholarly study, this very readable volume investigates twenty-one heartfelt prayers that produced results. 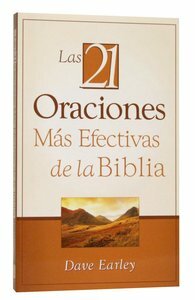 About "Los 21 Oraciomes Mas Efectivas De La Biblia (The 21 Most Effective Prayers Of The Bible)"
Dave Earley is pastor of Grace City Church in Las Vegas, Nevada. He is the author of 18 books and serves as online professor for Pastoral Leadership and Evangelism for Liberty University. More importantly, he is the husband of Cathy and the father of Daniel, Andrew, and Luke.